About Bodacious LIVE - Bodacious LIVE! Rouke van Der Veen was born in Zutphen, Holland and has been playing the guitar for over forty years. Rouke embodies the true spirit and passion of the 1960s where music had no boundaries and as a result, he enjoys playing a variety of styles, from country to jazz. He has been an original member of Johnny Limbo and the Lugnuts for over 25 years and has backed up the great Chuck Berry, Wolfman Jack, the Turtles, and many more. In the early 1980s Rouke spent two years on tour with Terry Evans and the Coasters and was exposed to not only roots based rock n' roll, but also contemporary R&B and soul. She has worked as a professional musician wearing many hats since age 18. Starting her career at the top, of a mountain that is... Timberline Lodge... she sang with a jazz group for many years and also formed many "folk groups" throughout the years. Her mentor, Mr. Richard Kohnstamm produced an album called simply "Julie" and it was sold at Timberline. She has self-produced other albums... "Sweet Dreams and Lullabies".. and co-produced with Pat Schweibert a project called "Momma". She wrote several of the songs on that album. She had the wonderful opportunity to go to Japan and sing there for 3 months in Toyonaka, outside Osaka and then to travel to Okinawa for a two month stint at the Manza Beach Resort with her daughter Shannon, who joined her in singing and experiencing the culture! She has taught music lessons...and studied music... the whole time, feeling that music is definitely a gift to be shared in as many ways as possible... the world seems to need more harmony than ever!!! Currently she works at the Portland Waldorf School accompanying the Eurhythmy classes and teaches private lessons and plays with a wonderful group called "Bodacious"... an eclectic blues/Cajun/anything goes group! They have just finished producing their first CD called "Love's De' Bottom Line"
She also continues to work as a single, playing piano and guitar, singing... and writing tunes and hoping for a more peaceful world! 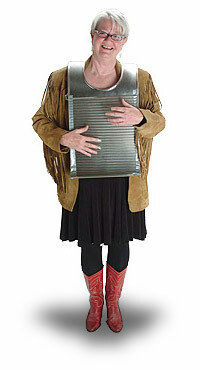 Doug Stickler has been playing accordion for 34 yrs. He studied with Don Bottari and Eileen Hagen and made his professional debut as a strolling musician at the Black Angus Steak House. Throughout high school, he also performed at The Rheinlander, The Little Blarney Castle, and The Chateau La France. After 10 yrs playing The Matterhorn Restaurant, he began working with other musicians in various combos. These have included Zydeco music with the band Bodacious; Italian opera and Neapolitan love songs with tenor, Tim Tommaso; as an accompanist for Joan Szymco's Veriditas Choir; and with Cliff Farley's Swiss Choir. He also plays in a Duo setting with violinist Frank Holman or guitarist Rouke Vanderveen. He has also been a studio musician, appearing on various CD's. Most of his work these days is with Bodacious. Band members include Julie McCarl, Rouke Vanderveen, (who is lead guitarist with Johnny Limbo and the Lugnuts), and Marvella McPartland. 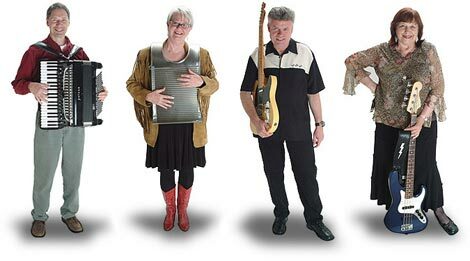 This versatile band is mostly a blues/boogie band that plays anything from Clifton Chenier Zydeco to Chuck Berry and rock and roll. Bodacious has also worked together in other settings including becoming an Irish band for McMenamin's St. Patrick's Day celebrations, and a German band for the Polkafest at the Paesano Club in Cedarville Park. His repertoire includes German, Swiss, Scandinavian, Irish, Italian, French, Zydeco/Blues, and Jazz Standards, primarily from the 1930's and 40's. 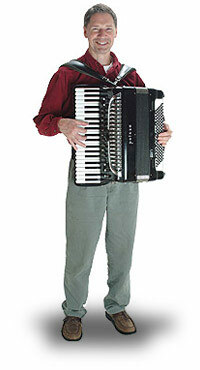 He is comfortable playing in most ethnic settings as a soloist, in a band, or any combination of the two. He plays acoustically as a soloist, but uses amplification when he plays in a band. 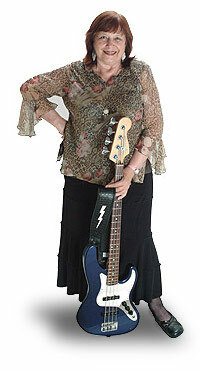 Marvella McPartland, bass and vocals, is a Portland area singer/songwriter. Born in Chicago and raised on the West Coast, she settled in Portland in 1982. Over the years she has performed in opening acts for many well known talents, such as Janis Joplin and Big Brother and the Holding Company, Jesse Collin Young and the Youngbloods, the Smothers Brothers, Otis Redding, Ricky Nelson, Bo Diddley, Kenny Rogers, Randy Newman, Nitty Gritty Dirt Band, and many others. She has worked with the musicians of Bodacious in various combinations for over 10 years. With a background in music that ranges from classical to rock and roll, from folk to jazz over many years, she plans to continue in music forever....and loves to perform with Bodacious! !